Catching Up plus Something For You! Hello there! I know its been a while and can you believe it, its the end of the catalog year already! Yikes! Well, I’m going to try to get you all caught up, plus I have a little something for you too. So, a quickie update for me – cause some inquiring minds want to know. 🙂 Its been a crazy couple months for me with my big move to Washington plus at the same time (literally the exact same time), we found out we are expecting again in December! So all of that has made it so that I’ve been completely exhausted for the last couple months. Thankfully, the haze is wearing off, and I’m so excited to get back to stamping, the new catalog, and CONVENTION! Its going to be an awesome summer! Alright, now on to more of the fun stuff – and getting you all caught up as well. LAST DAY of the 2010-2011 Catalog! Don’t miss out on your chance to grab some of the super cute items that will be no longer available after midnight MST tonight. Some retiring papers and accessories are on sale but have been selling out, so grab them while you can because they will be gone tomorrow! Plus, if you missed it on Facebook, I’m offering free shipping on all orders placed between now and July 5th. So, stack savings on savings and get a great deal! You’ve seen the Summer Mini, right? I mentioned it on a blog post ages ago, and I figure that most of you either have the mini catalog or have seen it online. But just in case you haven’t had a chance to check it out – you should! There are some fun summer projects, stamp sets, and embellishments. Plus a stamp set that Stampin’ Up came out with to support breast cancer research called Hope and Strength. I’ll be posting more projects using items from this mini over the next couple months, so come back and visit me to see more ideas. This catalog lasts until August 31st. The NEW 2011-2012 Catalog comes out TOMORROW!! Eek! So exciting! I can’t wait to share with you the new Idea Book & Catalog. I’ll be posting pictures and a link on my blog tomorrow when it goes live. So, if you don’t have a physical copy quite yet, you can come back and visit and check it all out. There are new stamps, new punches, new papers, new accessories, 5 new In Colors, and lots of project ideas combining the new with your old favorites! Plus, did you catch that you can get free shipping with me this weekend through July 5th, so you can come check it out and then get an extra awesome deal when you place your order! Are you excited yet? PS – do you need a copy of the catalog? Let me know and I’ll work with you to get you a copy. Just a heads up for all you digital scrappers and crafters out there. Stampin’ Up! has been going crazy adding a ton of new digital content online. They have brought back retired stamp sets and papers in digital form (so you can even print out your favorite patterns to incorporate into your paper projects) as well as adding brand new images and patterns that aren’t even available in non-digital form. There are so many cute items, that I can’t even describe them all. But I DID update the catalog link on the right sidebar of my blog with a link to the latest PDF version of the digital download catalog. It has pictures of everything currently available, so check it out and enjoy! Did you catch FREE SHIPPING?!? Just a couple details on my free shipping offer. From now until July 5th, any order placed with me will get free shipping. So you can use it to get your last chance items with free shipping, or all your new favorites with free shipping, or BOTH! 🙂 The only catch is that orders must be placed by calling or emailing me; sorry, I don’t have a way to credit shipping charges for online purchases. I’m so happy to be back to blogging and crafting and so grateful you have stopped by. 🙂 I have a lot to share and will have even more this month when I head to the Stampin’ Up! convention in a couple weeks! 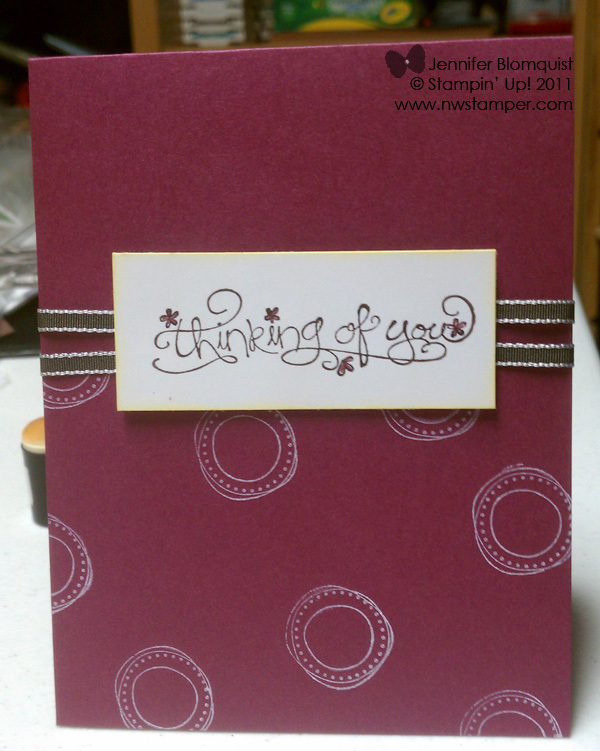 Until next time, here is a card I made for a friend when I mailed her a new catalog; hope you enjoy! Congrats on the move and the upcoming new baby. How wonderful for you and your dh. This card is gorgeous. Can’t wait to see a list of your fave new stamps when you have time. I have so many I like I don’t quite know where to start.